If you are not already a member of Holy Cross, please see our main home page, which has much more information for you. This page is for people who are already familiar with us and our website and just want to see the latest changes or news. Bridegroom Matins of Great and Holy Monday. Click for the Schedule of Services for Holy Week and Pascha as a PDf, or it is also on our Schedule page. Father Christopher collected a great wealth of spiritual resources for Lent and offers them in this letter to the Faithful. We said goodbye to our beloved friend and brother Doug (Reader John), and prayed for his repose. 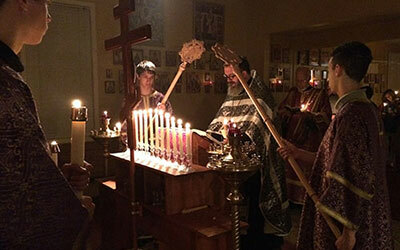 We have photos from the Sunday of Orthodoxy. We have photos from the Sunday of Forgiveness. We have photos from Nikolai's baptism! St. Nicholas came to visit Holy Cross! On the Sunday of Orthodoxy, we had a procession with icons, and took a photo of the children. Thanks to Whitney for photos from the Outdoor Blessing of the Waters on the Sunday following Theophany. For more, please see our Parish News, Photos and Videos page.